Games between the Fort Lauderdale Strikers and Tampa Bay Rowdies are always intense, but even more so on Saturday. Both enter with identical records in the Combined Standings and both are four points back of Minnesota United for fourth place and a potential berth in The Championship. The Strikers (4W-5D-5L, 17 points Fall; 8-8-8, 32 Combined) head into the Florida Derby with a seven-game unbeaten streak after a 1-1 draw with Rayo OKC last Sunday. Maicon Santos has spearheaded the attack and has scored in back-to-back games to increase his team-leading goal total to seven in 2016. The Rowdies (4-4-6, 16 Fall; 8-8-8, 32 Combined) also have an unbeaten streak, picking up points in their last four games, before facing the Strikers. Eric Avila scored the lone goal in a 1-0 win over the Carolina RailHawks last Saturday. Tampa Bay begins a crucial three-game stretch against sides near them in the Combined Standings – Fort Lauderdale, then Miami FC and Minnesota United – to stake a claim for a postseason berth. 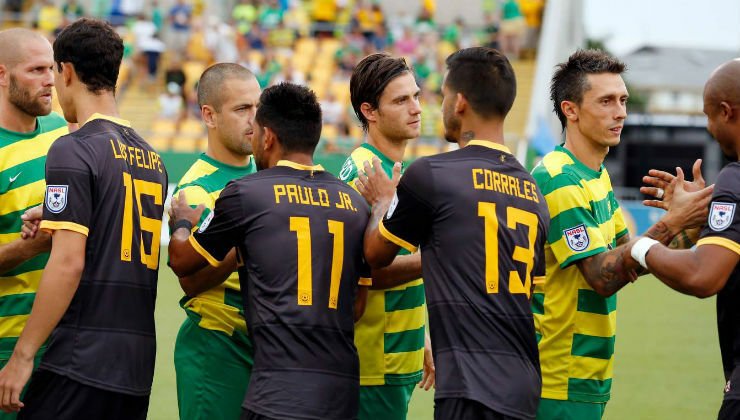 Tampa Bay already has two wins against their rivals, earning a 1-0 victory in the Spring Season and more recently defeating the Strikers, 2-1, at Al Lang Stadium. Central Broward Stadium | Lauderhill, Fla.
*Fort Lauderdale has international TV partners in various countries. Visit strikers.com for more information.